Surgeons have carried out the first ever robotic open-heart operations in Britain at the New Cross Hospital in Wolverhampton. The Da Vinci robot is remotely controlled by surgeons who are given a high definition view of the heart through a sophisticated camera. 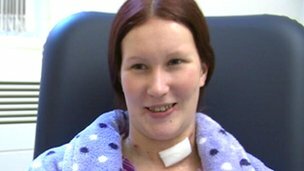 Natalie Jones, of Stourbridge, 22, was the first patient to have the procedure to have a hole in her heart repaired. Doctors claim the operation is safer for patients than conventional surgery. Normal heart surgery involves cutting open the breast plate, but the robotic arms are inserted by making cuts between the patient's ribs. A surgeon is given a 3D, high-definition view of the heart and can move the arms using a control panel. Each time they move their hand 3mm, the robot arm moves just 1mm. Mrs Natalie Jones had a 3.5cm (1.3in) hole in her heart repaired during surgery which lasted nine hours.Heart surgeon Stephen Billing said: "There is less pain and patients are able to return home to their normal activities far sooner." She said she wanted the procedure so she could get back to looking after her 21-month-old son, Dillon, as quickly as possible. She said: "I was scared, but I chose the robot surgery because I didn't want to have a large scar and I liked the idea of being the first." A more complex procedure - a mitral valve repair - was carried out on 43-year-old Paul Whitehouse from Halesowen. Doctors said that Mr Whitehouse might be able to go back to work as a self-employed builder after two months instead of the normal six months recovery time. New Cross Hospital hopes to carry out 30 mitral valve repairs a year using the robot that is already employed in other operations at the hospital. The UK is the third country in Europe after Sweden and Finland to perform open-heart surgery using robots. Surgeons Moninder Bhabra and Mr Billing and their team underwent extensive training in Finland before the first procedure. But Mr Bhabra accepts that the robot can only be used sparingly, because it is expensive. Each of its four arms has tools costing £2,000 that have to be replaced after 10 operations. "I accept money is tight within the NHS, but we can't be left behind by the rest of the world in developing what we are doing in surgery and other aspects of health care," said Mr Bhabra. “t Quoteour heart: A muscle that never gets tiredind out morerst."